HE Shell283 mm Spr.Gr. L/4.2 Kz. Initial HE Shell Velocity910 m./s. 150 mm L/55 MPL C/358 х 1 pcs. HSF Admiral Graf Spee — German promo premium Tier VI cruiser. Deutschland-class training ship of the Wilhelmshaven Maritime High School. The commander of the ship is Thea Kreutzer and the vice commander is Wilhelmina. She has 28 cm guns mounted on a hull with a displacement equivalent to that of a training cruiser, and her diesel propulsion gives her an extensive cruising range. She is valued on distance voyages for her long cruising range. From the series "High School Fleet". In the series, her long range is utilized in the foreign exchange voyage. HSF Admiral Graf Spee was released on both the NA and EU servers on 10 July 2017. HSF Admiral Graf Spee is a premium Tier VI German cruiser that is a re-skinned clone of the regular Tier VI premium Admiral Graf Spee. She straddles the line with battleships in several ways. Most notably, her main battery is comprised of 283mm guns: the same caliber as Tier III battleship Nassau and Tier VII battleship Scharnhorst. With an alpha damage of 8,400 per shell and a 20 second reload time, the guns perform exceptionally well against lightly-armored enemy units. As a cruiser, her version of the 283mm guns seem to have much tighter dispersion patterns than Scharnhorst, rewarding accurate shell placement; unfortunately, with only six barrels total, bad dispersion can still ruin what would appear to be a well-aimed salvo. Her other battleship-like characteristic is her access to the Repair Party ( ) consumable, normally reserved for Tier IX and X cruisers. Spee will need the extra health, as her maneuverability is far below most cruisers (but still better than many battleships). Like other Tier VI cruisers, she receives the option of equipping either Defensive AA Fire ( ) or Hydroacoustic Search ( ). Spee’s last major unique characteristic is her torpedoes. Her torpedoes have a range of 8.0 km instead of the standard 6.0 km found on most German cruisers, allowing captains to surprise enemies who may believe they are safely outside her torpedo range and providing a bit more flexibility in their use. While HSF Admiral Graf Spee is big and bulky, she is armored in a similar fashion to the rest of her cruiser classmates; she takes lots of damage and mistakes in positioning her will be quickly punished. Spee is not a ship for the un-skilled, but is a powerful tool in the hands of players who know how to minimize their exposure enemy fire and mitigate incoming damage. Largest health pool of all Tier VI cruisers. Access to the Repair Party ( ) consumable, giving her surprising durability. Good mid-range torpedoes with excellent firing angles. Largest guns of any cruiser with high penetration and alpha damage. Very high torpedo damage reduction for a cruiser, although this is an extremely situational advantage. Guns can citadel Tier VIII battleships if close enough. Genuinely sturdy ship that can survive against most cruisers it encounters. Only two turrets, which means getting all guns on target can leave Spee’s broadside vulnerable to return fire and if a turret is knocked out, it costs her half of her firepower. Despite having the largest guns of all cruisers, she has low potential damage per minute due to her rate of fire. With only six barrels and a slow reload, she will struggle when fighting destroyers. Torpedo tubes easily knocked out. Second slowest firing cruiser in game (only Furutaka’s stock guns are worse). Slowest of all Tier VI cruisers. Worst accuracy of all Tier VI cruisers. Her Repair Party ( ) consumable only has two uses (rather than the three found on battleships). As a premium ship, HSF Admiral Graf Spee doesn't have any upgrades to research. The upgrade options available for HSF Admiral Graf Spee won't radically alter how she plays, but they can be used to help shore up some of her weaker attributes. Main Armaments Modification 1 is the best fit for Upgrade Slot 1; with only two main battery turrets on a relatively slow reload, HSF Admiral Graf Spee shares Dunkerque’s vulnerability to turret-disabling hits. Damage Control System Modification 1 should be plugged into Upgrade Slot 2, while Steering Gears Modification 2 is recommended in Upgrade Slot 4 to improve her handling characteristics. This leaves only Upgrade Slot 3, which offers some intriguing options. Particularly daring cruiser captains might wish to equip Secondary Battery Modification 2 ( ); coupled with the German Hydroacoustic Search ( ), this would allow them to aggressively close with enemy cruisers and destroyers. It's a risky tactic given her relatively light armor scheme, but might pay off in certain situations given HSF Admiral Graf Spee’s healthy secondary armament. Either Aiming Systems Modification 1 or AA Guns Modification 1 ( ) are safer bets, offering small but notable buffs to her dispersion and anti-aircraft bubble, respectively. Captains are recommended to choose what they feel will best fit their play style for the ship. A ship of HSF Admiral Graf Spee’s size is going to find herself under quite a bit of incoming fire, making both Damage Control Party II ( ) and Repair Party II ( ) worthwhile investments in credits (or doubloons). The choice between Defensive AA Fire ( ) and Hydroacoustic Search ( ) is not an easy one; the former offers high resistance to aerial assault, while the latter provides large periods of time where HSF Admiral Graf Spee would be effectively immune to long-range torpedo strikes. Given her size and handling characteristics, both are good options; captains will have to make this choice for themselves based on which they fear more: carriers or destroyers. As a premium ship, HSF Admiral Graf Spee comes included with Type 10 camouflage that lowers her detection radius, reduces the accuracy of incoming shells, and increases the amount of experience she earns. HSF Admiral Graf Spee is a tad on the slow side for a cruiser; this can be helped by equipping Sierra Mike ( ) to bump her top speed to 29.9 knots. Other flags worth considering are: Mike Yankee Soxisix ( ) for captains who went with a secondary battery build; India Delta ( ) to get the most out of her Repair Party ( ); November Foxtrot ( ) to improve the cooldown times on her various consumables; and India Yankee ( ) to further increase her survivability. Graf Spee in the High School Fleet anime. Wilhelmshaven Maritime High School Flag. 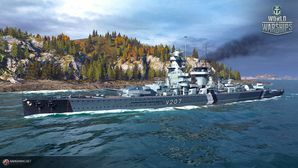 Given to players who purchased a special bundle containing HSF Admiral Graf Spee. Admiral Graf Spee at Spithead, England for the Coronation Review of King George VI, 20 May 1937. Due to the limitations imposed by the 1919 Treaty of Versailles, Germany was not allowed to replace its aging battleships until they’ve reached 20 years of service life. Furthermore, the replacement ships to be designed had to have a maximum displacement of 10,000 tons. Ultimately, the Navy decided on an unorthodox solution to mount capital-ship artillery on a lightly armored hull akin to a cruiser. This way, it satisfied the previous Treaty of Versailles, and the newer 1922 Washington Naval Treaty. This gave birth to the Deutschland-class panzerschiffes (“armored ships”); a modest nickname, concealing their true capability; Graf Spee being the third ship of the class. There were many design proposals as to the main armament of the ship. After much consideration, it was decided the vessel would mount six 283mm guns in 2 triple-gun turrets; "Anton" turret facing the bow, and "Brüno" turret facing the stern. A notable characteristic, which the German Navy preferred, was its high rate of fire at 3 rounds a minute. Similar rifles would later be found as the main armament on the Scharnhorst-class battleships. In the name of saving weight, further innovative choices were made, such as using electrical welding, which dissuaded the use of rivets that add considerable weight to a vessel, and improved streamlining. Furthermore, choice of propulsion fell to eight 9-cylinder, two-stroke MAN diesel engines. Advantages included being of lighter weight than contemporary boiler-based propulsion, and having greater fuel economy. As well, they could accelerate faster and produce less smoke; great tactical advantages for a commerce raider. She was also one of the first ships equipped with radar, a novel technology at the time. She mounted the FuMO 22 set with a single “mattress” array on the front-face of the forward primary fire detector. Due to its infancy, it was more accurate to sight ships with conventional means, but it conferred a great advantage in target acquisition at night-time and in poor weather. In conjunction with her spotter-aircraft, this made Graf Spee a potent merchant hunter. Ultimately, Graf Spee had a displacement of 16,000 tons due to it having the greatest armor of the class. Major improvements include: her armor belt was extended higher, her armor deck covered the entire length of the ship, and her torpedo belt was expanded, where as these choices were omitted in her sister ships to reduce weight. Although humorously, the Nazi Government insisted the ship weighed in at 10,000 tons. Graf Spee was laid down on 1 October 1932 at the Reichsmarinewerft shipyard in Wilhelmshaven, Germany, and launched on 30 June 1934. After her sea trials, she was commissioned into the Kriegsmarine on 6 January 1936. Commissioned in January 1936, Admiral Graf Spee conducted trials before being made fleet flagship. Her first notable duty was participation in the neutrality patrol off Spanish waters after the beginning of the Spanish Civil War in the summer of 1936. Conducting three such patrols through early 1937, Admiral Graf Spee was then assigned to represent Germany for the coronation of King George VI in May 1937. She then returned to neutrality patrols off Spain, performing two more, before returning to Germany in early 1938. Admiral Graf Spee then embarked on a series of port calls in Portugal and Spain, as well as transporting Adolf Hitler to Memel to inaugurate the integration of that city into the German Reich. The remainder of her peacetime service was spent participating in fleet maneuvers until late August, 1939. Admiral Graf Spee was pre-positioned to the Central Atlantic in the week before the declaration of war against Poland with orders to engage in commerce raiding. She was to adhere to prize rules (capture ships and evacuate crew if possible, sink targets only if resistance was given) and range freely while avoiding interception by enemy warships. Admiral Graf Spee, operating with Altmark as her supply and holding ship for prisoners of war, would prove to be an exceedingly capable raider of shipping. From late September through mid-December 1939, Admiral Graf Spee would operate in the South Atlantic and Southern Indian Ocean, capturing and sinking nine merchant ships as well as sparking an enormous hunt, to eventually include over 30 warships from Britain and France. ​Fortunately for Admiral Graf Spee, of the 30 ships dispatched to search for her, including four aircraft carriers, two battleships and a battlecruiser, her first and final true battle would pit her only against the light cruisers HMS Ajax, HMNZS Achilles and the heavy cruiser HMS Exeter. Here, Graf Spee lived up to the slogan of "outrun anything she can't outgun, and outgun anything she can't outrun"; Ajax, Achilles and Exeter were all faster than Graf Spee, but she had far larger guns than what the trio of cruisers carried. This encounter between the three cruisers and Graf Spee would come to be known as the Battle of the River Plate. At 05:52 on 13 December 1939, lookouts onboard Graf Spee spotted two tall masts on the horizon. By 06:00, Kapitän zur See Hans Langsdorff's crew identified one of the ships as HMS Exeter, and decided to attack. Graf Spee’s engines were pushed to full speed, creating a towering pillar of clearly visible black smoke, and the three cruisers saw her position. The battle truly begun at 06:17 when Graf Spee fired her first salvo on Exeter, hitting home amidships and dealing a great amount of damage to the ship's wheelhouse and killing all but 3 officers inside. At 06:23, her third salvo hit Exeter again, killing some of the ship's torpedo crews, damaging her communications, tearing holes in the funnels and destroying searchlights and the ship's on-board Walrus aircraft. Three minutes later, Exeter suffered further severe damage when her 'B' turret took a direct hit, taking the entire turret out of action. Exeter attempted to return fire, dealing minor damage, and Admiral Graf Spee dodged a torpedo salvo fired in anger by the surviving torpedo crews onboard Exeter. Meanwhile, Ajax and Achilles had initially stayed back and took a different course in an attempt to split Graf Spee’s fire. This plan worked briefly as, at 06:30, Graf Spee focused her 15cm secondary batteries on the pursuing light cruisers, but her fearsome 283mm guns stayed locked on to HMS Exeter. At 06:38, Exeter turned so she could fire her port torpedo tubes at Graf Spee, but she received 2 more direct 283mm shell hits; one knocked out her 'A' turret, further reducing the ship's firepower, while the other penetrated the ship's hull and started internal fires. Exeter’s wounds at this point were severe: two of her three turrets had been knocked out, her sole operational turret firing under local control (Exeter’s gunnery officer was standing on the turret roof and shouting instructions from there), and she was developing a list due to flooding. However, by sheer luck, Exeter’s engines took little to no damage in the engagement, and her 'Y' turret scored what proved to be a decisive hit: one of her 8-inch shells penetrated two levels of Graf Spee’s decks and exploded in the funnel area, destroying her raw fuel processing equipment and leaving her with only 16 hours of fuel — an insufficient amount to make it home — with damage too complex to repair under fire. Ajax and Achilles continued to pepper Graf Spee with fire while closing in from the northeast, but from such ranges that their 6-inch guns struggled to deal anything more than minor damage. By 06:50 Exeter was listing heavily to starboard and barely in the fight, but she continued to steam at full speed and fire upon at Admiral Graf Spee with her single working turret. At 07:10, Ajax and Achilles had drawn close to Graf Spee, and KzS Langsdorff's attention was drawn to the two light cruisers as they attempted to distance themselves. By 07:16, however, Graf Spee’s course was parallel to that of Exeter, and Graf Spee’s focus again turned to the badly damaged heavy cruiser. Heavier fire from Ajax and Achilles re-focused Spee’s attention back on the light cruisers, and she opened fire on them with her 283mm guns. Again, Graf Spee proved her accuracy, and at 07:25 Ajax suffered a direct hit that knocked out her 'X' turret and jammed her 'Y' turret, effectively halving the ship's firepower in a single strike. Exeter maintained fire on Graf Spee, and around 07:40 Langsdorff returned his focus to Exeter; a near-miss short-circuited the electronics of her sole operational turret, causing the now completely disarmed Exeter to finally break off from the battle. Graf Spee again attempted to pursue the ship, but Ajax and Achilles managed to distract Graf Spee long enough for Exeter to make good her escape. At this point, had she so chosen, Graf Spee could have easily dispatched the pair of already damaged light cruisers still hounding her and then set out to finish off Exeter, but KzS Langsdorff made the most crucial decision of the battle: despite Graf Spee having suffered little severe damage — the only notable damage she'd taken was a six-foot wide hole in the bow that was well above the waterline and two of her secondary guns had been knocked offline — the loss of her fuel processing equipment worried Langsdorff so greatly that he chose to break off from the battle and sail to the neutral port of Montevideo, Uruguay. Of the three ships that she engaged, only one of them was in a good enough shape to pose a threat to Graf Spee, and that was only if she scored a lucky torpedo hit. Ajax and Achilles attempted to pursue Graf Spee at a safe distance, to make sure she was going to port. However, even then Graf Spee still posed a threat, for at 10:10 Achilles drew too close to the panzerschiffe, and was nearly hit by a 283mm salvo. The occasional salvo was exchanged between the three ships as Graf Spee steamed for Montevideo for the rest of the day. Once it became clear that she was entering port, Achilles broke off and took watch over the River Plate with Ajax, as the Battle of the River Plate ended. Over the next several days, KzS Langsdorff was made to believe that a enormous British fleet was heading for him, when, in reality, no such force existed. It was a carefully-crafted deception by the Royal Navy that was at least partly true: a British cruiser squadron was being reinforced immediately with the heavy cruiser HMS Cumberland; the battlecruiser HMS Renown and the aircraft carrier HMS Ark Royal were to arrive in the area by 19 December; three more cruisers plus a destroyer division were on the way. It is likely that had Graf Spee chosen to fight her way out of Montevideo, these remaining Royal Navy units wouldn't have made it in time, as Langsdorff had initially planned to leave by the 17th at the latest. However, Langsdorff believed if he ran into any more ships he may not make it out alive — during the Battle of the River Plate he'd been wounded twice and knocked unconscious, and the ship had spent over 50% of her 283mm ammunition — and he thought he was facing at least a battlecruiser, an aircraft carrier, three or four cruisers, and a destroyer flotilla. He messaged Berlin asking for advice, whether to allow the ship to be interned or scuttled, and was told that the best option was to fight his way out, or — if he had no other choice — to scuttle the ship. Faced with daunting odds — including a battlecruiser that was one of the few ships that could outrun and outgun Graf Spee — Langsdorff opted to scuttle his ship. At 19:01 on 17 December, Admiral Graf Spee sailed out into the estuary of the Plate, with most of her surviving crew aboard the German steamship Tacoma behind her. At 19:56, smoke was seen rising from Graf Spee, just before an enormous explosion occurred that was designed to be as dramatic as possible. The surviving crew of Admiral Graf Spee were taken south to Buenos Aires, Argentina, where Kapitän zur See Hans Langsdorff committed suicide on 19 December. Langsdorff and the other German dead were buried in Buenos Aires; his remaining crew were interned there for the duration of the war. In the end, the loss of Admiral Graf Spee was a major propaganda victory for the British and French (and a publicly embarrassing event for the Germans, particularly the Kriegsmarine); Langsdorff's decision to scuttle the ship is said to have enraged Adolf Hitler. The Battle of the River Plate is known as the first naval battle of the Second World War: an era which ushered in countless technological advances to naval technology, several of which had their first true tests in combat in the south Atlantic off the coast of Uruguay. Vizeadmiral Maximilian Reichsgraf von Spee, for whom Admiral Graf Spee is named. US Office of Naval Intelligence recognition drawing of a Deutschland-class cruiser. Close-up view of Admiral Graf Spee’s forward 283mm turret. Admiral Graf Spee at anchor, circa 1936. Aerial view of Admiral Graf Spee at Spithead, England for the Coronation Review of King George VI, 20 May 1937; HMS Hood and Resoultion are in the background. Admiral Graf Spee before the war. Admiral Graf Spee returning from an Atlantic cruise, October 1938. Aerial photograph of the Admiral Graf Spee in the English Channel, 1939; note the exquisite curvature of her aft design. Stern view of Admiral Graf Spee underway, circa 1939. Her quadruple-tube torpedo launchers are clearly visible in the foreground. Graf Spee with a fake "Bruno" turret, intended to confuse her enemies. Aerial shot of the Graf Spee's fake "Bruno" turret. Admiral Graf Spee at anchor in Montevideo harbor following the Battle of the River Plate, December 1939. Admiral Graf Spee, starboard. Shell splinter damage is visible on the hull below the open control station and armored bridge. Admiral Graf Spee burns off Montevideo, Uruguay after being scuttled by her crew, 17 December 1939. Admiral Graf Spee, port amidship. Damage from shell splinters as well as the burned out Arado Ar 196A-1 still resting on the catapult is visible. Admiral Graf Spee after scuttling. This photograph was taken in February 1940. A view forward from the bow turret on Admiral Graf Spee in February 1940. The forward superstructure of Admiral Graf Spee in February 1940, after she was scuttled. The open control station on 'Admiral Graf Spee. The armored conning tower, various periscopes, rangefinder, target designators, and ship controls are visible. Taken February 1940. The view aft from the forward superstructure of Admiral Graf Spee in February 1940. Graf Spee's salvaged rangefinder (and one of her anchors, not shown) is on display in Montevideo today. This page has been accessed 66,194 times.